(also known as "that time my kid went viral"). Originally published on Facebook on February 27, 2017. Forgive me, guys. I have to be a gushing mom for a moment. 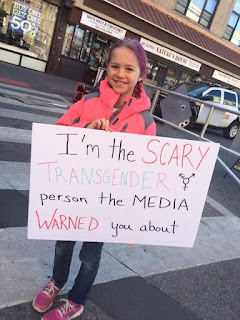 This 10 year old girl stood up yesterday at a microphone in the street and told 200+ people why we need to stand up for not only trans rights but all rights. THIS IS WHAT IT MEANS TO BE BRAVE AND KIND! We know how good she has it. We know the difference a supportive family and a supportive school make. And we know that rescinding the guidelines on supporting trans students disproportionately affects the most vulnerable. Black trans youth. Latinx trans youth. Immigrant trans youth. Muslim trans youth. Economically disadvantaged trans youth. Youth who live at the intersection of these identities and more, youth who are marginalized two and three times over just because of who they are, where they live, what they believe, or where they come from. This is why we will keep fighting. Here is video of her speech from that day. She is fierce and authentic. She will change the world just by being herself. And I am absolutely a proud, gushing mom. I want to hear from you! Leave your comments. It may not show up immediately because I moderate comments due to spam. I promise I'll get to it as soon as possible and look forward to talking to you!